In this episode, Emily interviews Dr. Amanda, a tenure-track professor at a small college in the Midwest. While a postdoc, Amanda listened to career advice from R1 university faculty, but ultimately decided their path was not for her. 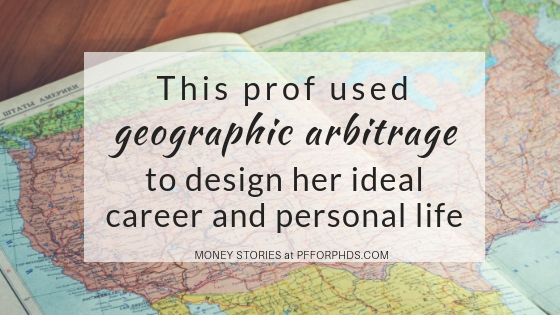 Instead, she employed geographic arbitrage to maximize her academic salary while minimizing her cost of living. This choice enabled her to quickly pay off her student loans, and now she is considering buying a house. Amanda gives great career and financial advice and encouragement to current graduate students and postdocs, particularly emphasizing the importance of deciding for yourself what your career and personal priorities are. Amanda writes about personal finance at Frugal PhD. Amanda has a PhD in Digital Media. She does research on digital media and learning, and digital equity. She teaches courses on these topics, and on research, writing, and information literacy. She completed her PhD in 2015 at a large research university in the midwest. She did a two year postdoc at a large private university in California. She got married during her postdoc to another PhD who she met during graduate school. Now, she is a faculty member at a small liberal arts college in the midwest. 3:07 What is geographic arbitrage? Geographic arbitrage is a concept promoted within the Financial Independence / Early Retirement (FIRE) community. Arbitrage is the practice of taking advantage of different prices in different markets. Geographic arbitrage is taking the cost of living of different places into account and taking advantage of the fact that your dollars can go farther in a place with a lower cost of living. If you’re still working, you can see if you can find a higher salary or work remotely to live in a place with a lower cost of living. If you’re financially independent, you would move to the place with the lower cost of living to stretch your dollars. 4:34 How did you use geographic arbitrage in your job search? During her postdoc, Amanda and her husband lived in a large city in California with one of the highest costs of living in the U.S. They considered what their finances would have to be to live comfortably there, including what the downpayment on a house would be and what it would take to pay back student loans. When she was on the job market, she started to pay attention to how salaries compared to the cost of living. Although people expect salaries to be higher in more expensive places, she realized that this pattern was not consistent for academic jobs. Amanda had an interview for a job in a city with a high cost of living, but the salary was less than what she received as an editor with only an undergraduate degree. Then she interviewed for another position in a small city with a low cost of living. The institution offered her a salary comparable to what a first year faculty member would have been making in her current location in California without adjusting for cost of living. This discrepancy in salaries and cost of living caught her attention. Both Amanda and her husband had a campus interview in a city on the West Coast, but it was one of the most expensive zip codes in the U.S. They realized that even with spousal hire, they still wouldn’t make enough money to afford a house. They decided to move to a semi-rural part of the midwest for Amanda’s job offer, even though her husband didn’t have an offer in that location. Amanda accepted a tenure track position in a location where they could both live on only Amanda’s salary. Emily shares her experience, which contrasts to Amanda’s experience. Emily lives in Seattle with her husband. Seattle has a high cost of living, which Emily believes is associated with the opportunity of getting tech jobs from Amazon, Microsoft, and many other places. However, faculty jobs are distributed across many locations, so there may not be correlation of place with salary. Amanda shares that she considered jobs in Seattle, but being near family mattered to her. Amanda’s family lives in the midwest, where she lives now. Emily shares this value, but Emily wants to move to Southern California to be close to family and is willing to put up with higher cost of living to be near them. 12:13 What did you hear from other academics? How did you take or filter that advice? PhDs from research institutions receive a lot of advice about landing tenure track jobs and getting positions at R1 universities. Amanda says many people assumed she wanted a tenure track position at an R1 university. However, because Amanda attended a small liberal arts college for undergrad, she felt like her goal was to work at an small college. She felt like she couldn’t be transparent about her goal. She got a lot of advice about how to get a position at a big research university, how to negotiate spousal hire, and how she should be willing to go anywhere for the R1 position. She felt like a big university wasn’t the best fit for her. Amanda and her husband felt like they could be happy in the academy as well as outside of it. Amanda felt pressure to be in academia, and academy was the only trajectory she could speak about with her mentors. She struggled with how she could talk about what she wanted. Amanda and her husband have important personal goals, and they want work-life balance. They decided to accept Amanda’s job offer in the midwest even though they both had more interviews planned. This gave Amanda’s husband more time to explore job options and say yes to the right thing. Amanda and her husband’s financial situation allowed them to make these decisions. They have a solid emergency fund, live on a portion of their income, and work in a place with a low cost of living. Money gives you the flexibility to pursue what you want professionally and personally. Emily discusses the financial strategy for two-income households to budget off of only one income, so the other income is free for financial goals. 19:30 How has your choice to live in a low cost of living location affected your finances? Amanda’s husband accepted a new job last year. Since then, they both made major progress on paying off their student loans. They have paid their loans off completely. They accomplished this goal by deciding to keep living off only one income. Amanda’s husband’s income went toward their student loan payments. Amanda says that academic life is inconsistent and can make budgeting challenging. She attends conferences and travels often, but it’s made easier when she’s not worried about when reimbursements are going to come in. Budgeting for travel and reimbursements is hard for graduate students, and it is hard for faculty members too. 22:35 What are your next financial goals? Amanda and her husband are figuring out their plan for home ownership. Navigating the career stages of graduate student, postdoc, faculty as a pair can be very challenging. Many partners spend time living apart. People with PhDs seem to delay home ownership more than other groups of people. They are considering buying a single family home, but a duplex or triplex appeals to them so they can bring in extra income from renting the other units. They are still considering if purchasing property makes sense for them at this time and in this location. Another one of their goals is to get caught up by saving, investing, and building retirement funds. She needs to balance buying a house with saving for retirement. Amanda and Emily discuss that common retirement savings benchmarks, like retirement fund of one year’s salary by age 30, are challenging for PhDs to meet. Many people don’t start saving for retirement until their 30s, not just in the PhD community. Amanda says that finance benchmarks can be very demoralizing, and she wants people to know that it’s never too late to care about your finances. 27:44 Advice for setting personal finance goals. Amanda emphasizes that she didn’t learn about personal finance until she was in her postdoc. As a graduate student, she was not financially savvy. 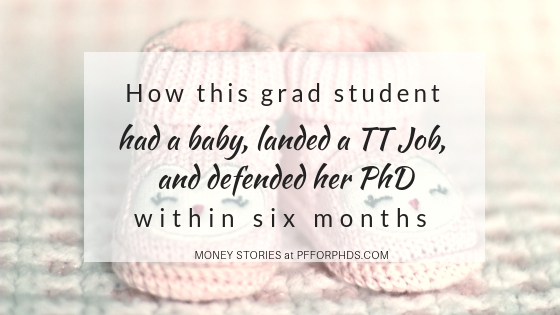 Once she was a postdoc and her husband was working full time, they started learning about personal finance. Amanda says she used her graduate student situation as an excuse to put off thinking about finances. She used to think money was something that could work itself out later. Now, she knows it’s never going to work itself out later. Amanda wishes she hadn’t used being in graduate school as an excuse to not know about personal finance. A common roadblock is figuring out where you are financially, because it’s uncomfortable. Becoming aware of your finances is the first step to set goals and make progress. The beginning is the hardest part, bud don’t give up. Amanda used the Personal Capital tool to track her net-worth and visualize her finances. In just a few years, Amanda has changed her financial situation. Now she makes intentional decisions and has seen big changes in her finances in a short period of time. Amanda connects her career decisions to her new attitude towards finances. When Amanda felt trapped in the R1 career trajectory, she avoided thinking about personal finance. She realized she needed to be assertive about the career she wanted and finances, because this was related to her quality of life. As she opened up to other career trajectories, she realized that being in a good place financially is deeply connected to her goals. Emily shares that sometimes personal and professional aspects of decision-making in our lives collide, and maybe personal life holds sway, but it’s not easy to talk about in a professional setting. 33:10 What is your advice for someone finishing their PhD training and looking for job? Amanda tells other PhDs looking for a job, “you have options!” Amanda accepted the narrative about tenure track jobs at R1 universities, but she felt it was so empowering to realize it was her life. She says do everything you need to do to figure out what will fulfill you and make you happy. Make sure you are true to you and what you want. The online community Beyond the Professoriate helps PhDs explore non-academic positions. Amanda took an online class, and it was great to have community and resources. She learned how to make use of LinkedIn, how to make CV into a resume, how to network, and how academic skills are useful in industry. Beyond the Professoriate has an online conference every year. Additionally, there are resources for understanding your finances at Emily’s site Personal Finance for PhDs. Keep general savings to supplement your emergency fund for conference expenses (even if they will be reimbursed), research expenses, career counseling, travel, relocation costs for summer work, etc. If you are facing one of these opportunities without accessible funds, you will have the choice between not pursuing the opportunity and going into debt. It’s reasonable to keep some amount of general savings on hand just for flexibility. However, the sooner you can anticipate the opportunity, the sooner you can set a savings goal to help you take it.